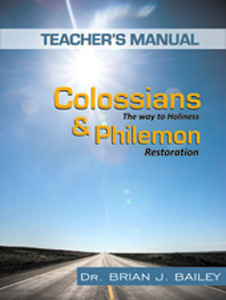 This teacher manual is based on Colossians & Philemon which is an easy reading verse by verse commentary on those most blessed New Testament letters of the Apostle Paul. Dr. Bailey emphasizes the vital message of following the way to holiness as seen in the epistle to the Colossians, as well as the message of restoration in that a slave becomes a brother in the epistle to Philemon. This book will be enjoyed by those who seek to find the true pathway to the presence of God and the place of restoration whereby we can be called the sons and daughters of God.